We are a leading Manufacturer of vibratory paper jogger for banks from Mumbai, India. We are the prominent manufacturer and supplier of best quality Vibratory Paper Jogger for Banks. In this the bunch of papers are placed on an inclined tray and they are vibrated to get stacked over the right angled edges. The stacked bunch may be tied or sent for further processing like printing, gluing, cutting, binding, stamping etc. 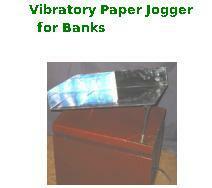 Looking for Vibratory Paper Jogger for Banks ?